Burbank, CA, January 15 – Welcome back to Hogwarts when “Fantastic Beasts: The Crimes of Grindelwald,” the second of five all new adventures from the Wizarding WorldTM created by J.K. Rowling, arrives on 4K UHD Combo Pack, Blu-ray Combo Pack, DVD Special Edition and Digital. “Fantastic Beasts: The Crimes of Grindelwald” features an ensemble cast led by Johnny Depp (the “Pirates of the Carribean” films, “Sweeny Todd: The Demon Barber of Fleet Street”), Eddie Redmayne (“The Theory of Everything,” “Les Misérable”), Jude Law (the “Sherlock Holmes” films, “Cold Mountain”), Katherine Waterston (“Inherent Vice,” “Alien: Covenant”), Dan Fogler (“The 25th Annual Putnam County Spelling Bee,” TV’s “The Walking Dead”), Alison Sudol (TV’s “Transparent”), Ezra Miller (“The Perks of Being a Wallflower,” “We Need to Talk About Kevin”), Zoë Kravitz (“Dope,” “Mad Max: Fury Road”), Callum Turner (“War & Peace,” “Green Room”), Claudia Kim (“Avengers: Age of Ultron,” “The Dark Tower”), William Nadylam (“SK1,” “Kirikou and the Sorceress”), Kevin Guthrie (“Sunshine on Leith”), Carmen Ejogo (“Selma,” “It Comes at Night”) and Poppy Corby-Tuech (TV’s “Harlots”). “Fantastic Beasts: The Crimes of Grindelwald” is directed by David Yates, from a screenplay by J.K. Rowling. The film is produced by David Heyman, Rowling, Steve Kloves and Lionel Wigram. Tim Lewis, Neil Blair, Rick Senat and Danny Cohen serve as executive producers. “Fantastic Beasts: The Crimes of Grindelwald” reunites the behind-the-scenes creative team from the first “Fantastic Beasts” film, including Oscar-winning director of photography Philippe Rousselot (“A River Runs Through It”), three-time Oscar-winning production designer Stuart Craig (“The English Patient,” “Dangerous Liaisons,” “Gandhi,” the “Harry Potter” films), four-time Oscar-winning costume designer Colleen Atwood (“Chicago,” “Memoirs of a Geisha,” “Alice in Wonderland”) and Yates’ longtime editor Mark Day (the last four “Harry Potter” films). The music is by eight-time Oscar nominee James Newton Howard (“Defiance,” “Michael Clayton,” “The Hunger Games” films). The 4K Ultra HD Blu-ray disc of “Fantastic Beasts: The Crimes of Grindelwald” will feature Dolby VisionTM HDR that dramatically expands the color palette and contrast range and uses dynamic metadata to automatically optimize the picture for every screen, frame by frame. The 4K Ultra HD Blu-ray disc of “Fantastic Beasts: The Crimes of Grindelwald” will also feature a Dolby Atmos® soundtrack remixed specifically for the home theater environment to place and move audio anywhere in the room, including overhead. To experience Dolby Atmos at home, a Dolby Atmos enabled AV receiver and additional speakers are required, or a Dolby Atmos enabled sound bar. Dolby Atmos soundtracks are also fully backward compatible with traditional audio configurations and legacy home entertainment equipment. “Fantastic Beasts: The Crimes of Grindelwald” will also be available on Movies Anywhere. Using the free Movies Anywhere app and website, consumers can access all their eligible movies by connecting their Movies Anywhere account with their participating digital retailer accounts. 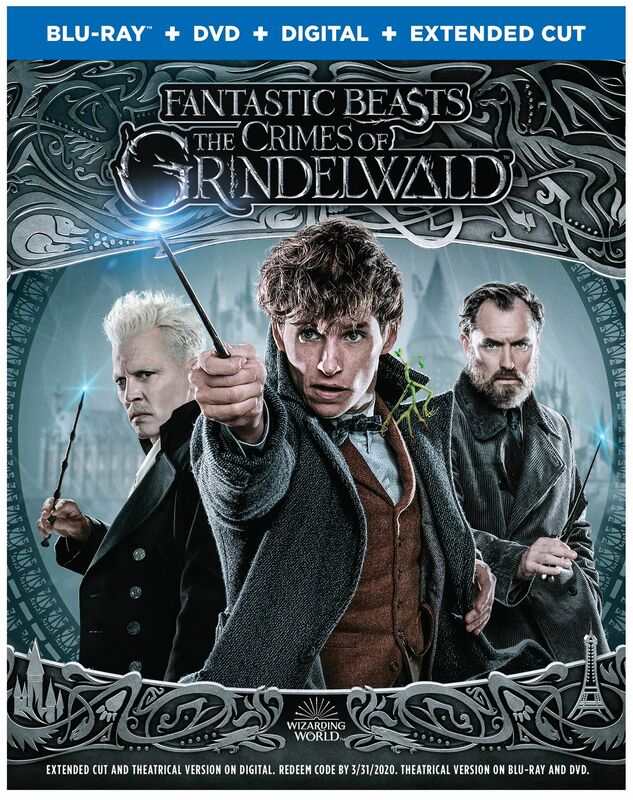 Fans can also own “Fantastic Beasts: The Crimes of Grindelwald” via purchase from digital retailers beginning February 15. More than two decades ago, a young Harry Potter was whisked onto Platform 9¾ at King’s Cross Station, and readers everywhere were swept along with him into a magical universe, created by J.K. Rowling. In the years since, the seven Harry Potter bestsellers have inspired eight blockbuster movies, an award-winning stage play, and, more recently, the successful start of the Fantastic Beasts five-film franchise. People of all ages have been enthralled by these extraordinary adventures, set within an ever-widening shared universe, inspired by the vision of J.K. Rowling. For today’s growing worldwide fan community, and for generations to come, the Wizarding World welcomes everyone to explore more of this magical universe—past, present and future. The Wizarding World also provides fans with an instant, trusted kite-mark of quality and authenticity. On February 15, “Fantastic Beasts: The Crimes of Grindelwald” will be available to own in high definition and standard definition from select digital retailers. On March 12, “Fantastic Beasts: The Crimes of Grindelwald” will be made available digitally on Video On Demand services from cable and satellite providers, and on select gaming consoles.